Why does my dog "steal" things? Most puppies and many adolescent dogs love to explore and chew, so it should be no surprise when they steal household objects. When you try to get these items back from your dog, a chase ensues because the game is fun, because the dog enjoys the attention and because the dog is reluctant to give up its new found "treasure". 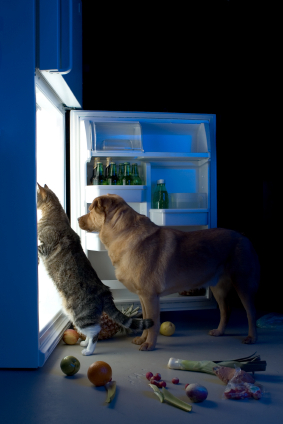 Dogs may raid garbage, steal food off tables and countertops, and enter cupboards or refrigerators, where they help themselves to snacks. Despite owner attempts at punishment, these behaviors continue. Why do these behaviors continue? When dealing with an unwanted behavior, look for the motivation. Food items are appealing on their own. Some puppies steal objects when they are unsupervised, because they have not been directed to an acceptable activity. Puppies may continue to steal because the game of chase is so much fun. Each of these motivations has a different treatment. "... your options are to consider crate or confinement training or to arrange the environment so that the puppy cannot get to items." If left to their own devices, most puppies will get into what we would refer to as "trouble". Therefore, you should first focus on insuring that your dog has a sufficiently enriched and predictable daily routine (see our handout on 'Training Dogs – Enrichment, Predictability and Scheduling') that meets its needs for social interactions, exercise, play and exploration. Puppies should be supervised at all times, since they could be engaging in behaviors that you consider undesirable whenever they are out of sight. When you cannot watch your dog, insure that it is confined to an area where it cannot gain access to any objects or any areas that you consider "out of bounds." Depending on what your dog might steal and where you do not want your dog to go, your options are to consider crate or confinement training (see our handout on 'Crate Training in Dogs') or to arrange the environment so that the puppy cannot get to items. For example, close doors, or use barrier gates, child proofing devices or even motion sensor devices to prevent access to restricted areas and to properly monitor your home. It might also be helpful to booby-trap objects with taste aversives or motion detector alarms (see our handout on 'Behavior Management Products'), to teach the puppy to 'stay away'. At the same time, place highly appealing non booby-trapped items nearby so that the pet learns the safe and acceptable alternatives for chewing and play. If your puppy steals in your presence, the best means of control and prevention is to leave a long leash attached, preferably to a head halter. Then as the puppy begins to approach objects that it might chew or areas that you consider as "out of bounds", a quick pull on the leash coupled with a "leave it" command and praise for compliance will teach it to stay away. How do I train leave it? Often the command "leave it" is used to teach dogs not to pick up items. It is easiest to teach "leave it" using a head collar and leash. Start with the dog wearing a head collar and an adult holding the leash. The dog is then walked toward an item he may wish to pick up, such as a paper bag or plastic food container. Choose training objects that are not of value to you, that will not prove particularly enjoyable to the dog and are not likely to injure the dog if you cannot take them away. As the dog reaches for the item, calmly say, "leave it" and turn the dog's head using the head collar; quickly offer a food reward and "good dog" as the head comes toward you. Repeat several times with low-value items. As the dog learns the meaning of the phrase he will begin to turn his head, perhaps even without a pull of the leash. Immediately reward that behavior. Progress to more valued items and gradually phase out food rewards while retaining verbal praise. At the same time, throwing small treats on the floor, having your dog stay by your side and then using a "take it" command, can help to teach the dog that you will be responsible for what the dog takes and leaves (see our handout on 'Training Dogs – Play and Exercise'). Other techniques, which may not give as consistent results, would be to use a leash and the word "leave it", following by a shake can, an audible or ultrasonic device or a remote activated spray collar to deter the undesirable behavior and then to teach your dog to settle and play with an appropriate chews and toy. Teaching drop and give commands are also important to prevent and control possessive behaviors (see our handout on 'Training Dogs – Teaching Give and Drop'). "Teaching drop and give commands are also important to prevent and control possessive behavior." Another technique is to place a bitter spray on objects and as the puppy approaches give the leave it command. If the puppy does not immediately stop, then the puppy will learn that the object is distasteful and unpleasant if it accidentally gets close enough to put its mouth on the object. When there are items that the puppy is allowed to pick up, use the command, 'take it'. This 'take it' command can even be extended to the food bowl or when giving treats or toys to your dog. Before offering the toy, treat or food, first have the puppy sit, and then give the 'take it' command when its time for the reward. The goal is not only that the puppy learns the 'leave it' command, but also that the pup learns only to pick up objects when it has permission to do so. If your puppy is stealing things because the game is so much fun, then don't play! Avoid the chasing game wherever possible. If the puppy is wearing a long leash, then use a 'come' command and pull on the leash. Have the puppy sit, use the drop or give command (see 'Training Dogs – Teaching Give and Drop') and when the puppy drops the object say 'good dog'. For some puppies, if you ignore them when they steal things and try to engage them in something else instead, they may "give up" the object voluntarily. A puppy that is used to being chased may begin to approach you with the stolen object in an attempt to solicit chase. Should this occur, try crouching down and in a happy voice, with open arms, call your puppy to you. When the puppy looks toward you, say "good puppy, come show me!" Keep up the praise as the puppy approaches. With a treat, entice the puppy to come, show the treat and when the puppy drops the stolen object, say 'good dog'. Make it come closer, sit, and then give the reward. Of course, once the dog has learned the 'give' command (below), use this command instead. Most importantly, never reach for your puppy in anger after it has taken something. Remember, the behavior you want to change is the stealing, not the cowering under the table. When you threaten your pet in that way, you risk fear and aggression. In addition, you are reducing, not improving the chance that your puppy will give up the item voluntarily. In fact, threats and punishment are likely to make your puppy increasingly more possessive. If your dog displays well-established stealing behaviors coupled with avoidance responses see our handouts on 'Aggression in Dogs – Possessive, Toy Guarding' and 'Aggression in Dogs – Food Bowl Guarding'. How can I get stolen objects away from my dog? You need to teach your dog a command that tells him not to touch an item, such as "leave it", as well as commands to give up the object if it is stolen. Remember that training a successful drop command may prevent damage and possessive aggression but in no way does it stop stealing behavior. See our handout on 'Training Dogs – Teaching Give and Drop'. If your dog has stolen something that cannot be ignored and will not drop on command, then you may soon have a problem with possessive aggression (if it is not already a problem). If a leash and head halter have been left attached, it may be possible to gently remove the object while restraining the mouth. However, the head halter does not aid in opening the mouth and therefore does not give any assurances that items can be safely or effectively removed. (Please see our handout on 'Aggression in Dogs – Possessive, Toy Guarding'). How can I stop stealing in my absence? This requires either preventing access to problem areas or using "booby-traps". Booby-traps, if sufficiently aversive, can be an effective way to keep a pet away from an area or an object. Examples of these devices are Snappy Trainers®, extremely bitter or hot tasting sprays, motion detector alarms, motion detectors that sprays air (SsscatTM) or electronic avoidance devices which activate a collar that sprays the dog with air when it approaches. (See our handouts on 'Behavior Modification - Using Punishment Effectively' and 'Behavior Management Products' for more details). Over time, the pet may learn to avoid the area or the sight of the punishment device. "Booby-traps, can be an effective way to keep a pet away from an area or an object. " 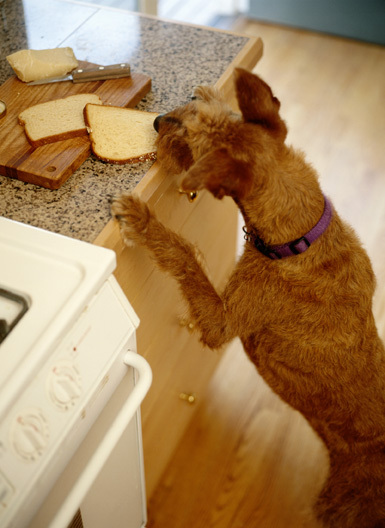 For dogs that are stealing food or raiding the garbage, prevention is necessary as no amount of punishment will be sufficient to deter a dog that has access to a highly motivating food item. Consider two trash containers in your kitchen; a small one in a cupboard or on a counter that is out of reach, in which food items are placed, and a large one for non-edible trash that can be left out in the room. This might totally deter food stealing since garbage is no longer accessible. How can I keep my dog from going into rooms or on furniture? Although this is another owner absent behavior, some pets can be taught to stay off furniture and to stay out of certain rooms, by consistently preventing the behavior while you are at home by controlling your dog with a leash (and preferably a head halter), by using aversive devices such as shake cans, audible or ultrasonic devices or a remote spray collar to deter the behavior while you are supervising, or to use booby traps such as an avoidance unit with a spray collar, or a motion detector with an audible alarm or air sprayer (SsscatTM). See our handout on 'Behavior Modification - Using Punishment Effectively' for details. By pairing these devices with a marker such as a gate, ribbon, handkerchief or piece of tin foil placed across the doorway or on the furniture, you can help the pet to learn what and where to avoid. When you are out, you must insure that your pet cannot gain access to the area until it learns to stay away. Be consistent. Never encourage your dog to go on the furniture or enter the rooms, and at the same time be certain that there is nothing on the furniture or in the rooms that is particularly appealing (which may encourage your dog to return). "... best approach is to focus on providing rooms and areas where the pet prefers to sleep, relax and explore." Of course, in addition to preventing or deterring access to these areas, the best approach is to focus on providing rooms and areas where the pet prefers to sleep, relax and explore. By providing resting areas and rooms where the pet has comfortable bedding and where it receives a variety of new and novel toys for play and chewing, your dog should become increasingly motivated to play and sleep in the rooms that you prefer, and likely lose any desire to enter into these other areas.